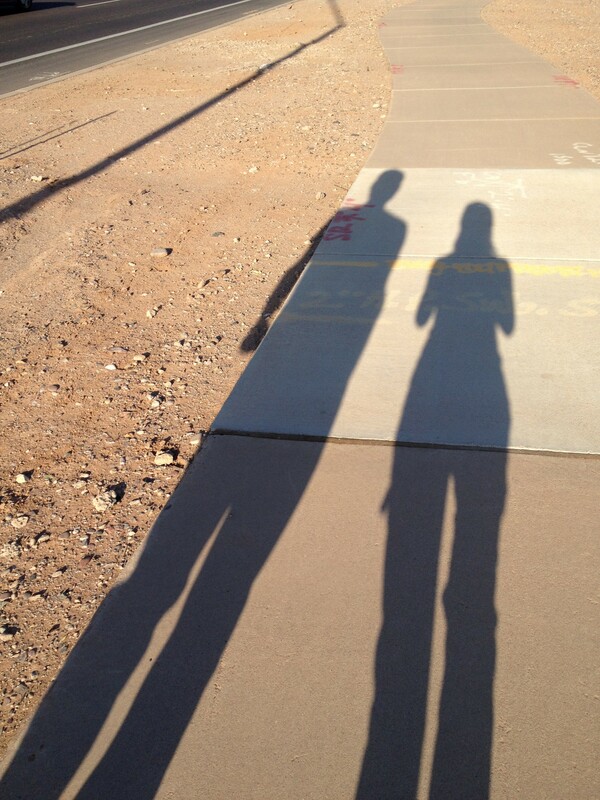 "Me and my shadow" and Hubby's too! Taking the road less travelled--walking a sidewalk along a major street in our suburban town. Kierkegaard was right, you know. Since incorporating walking into our daily routine a year and a half ago, Hubby and I have walked ourselves to health. Not only are we free from medicines related to high cholesterol and diabetes, walking changed the way we see our sprawling suburb and the way we plan our trips. I don’t know about you, but the idea of walking five miles on a treadmill or hiking around a track over and over again has absolutely zero appeal. Combine those walks, though, with stuff I have to do anyway and, not only do we get our exercise, we get that other stuff done at the same time. Plus–and this is a bigger deal than I would ever have imagined before–we connect to the bigger world, experience the seasons, discover local art and artists, and meet new people because of it. Much to our surprise, incorporating walking into our regular routine really makes us happy. 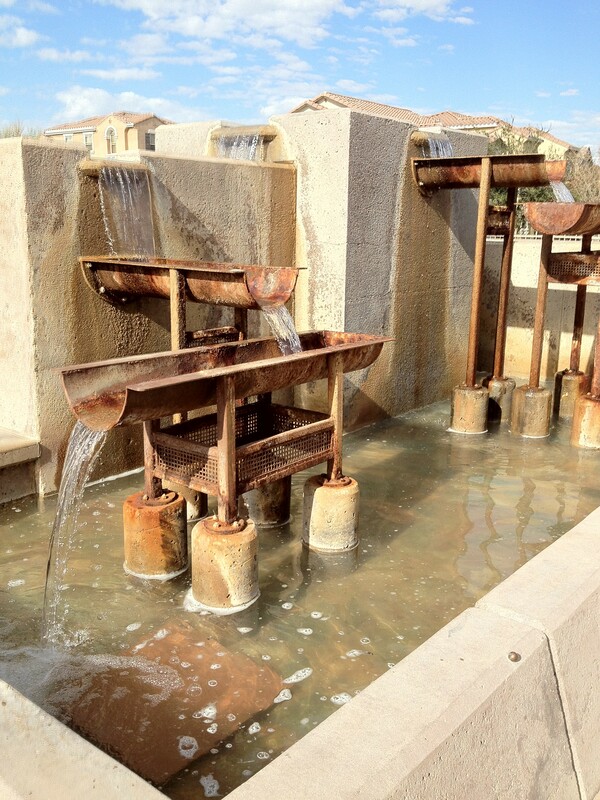 Cool fountain we discovered on a walk to the farmers market. Each day Hubby and I strive to walk at least 10,000 steps. This is the equivalent of five miles. Hubby tends to walk more than that each day, achieving around 13,000 steps or more on average. My average tends to hover right around 10,000 steps a day, with a few days of 12,000 and a few 9,000. In general, if we did not strive to hit this goal, each of us would average about 2,000 steps a day. 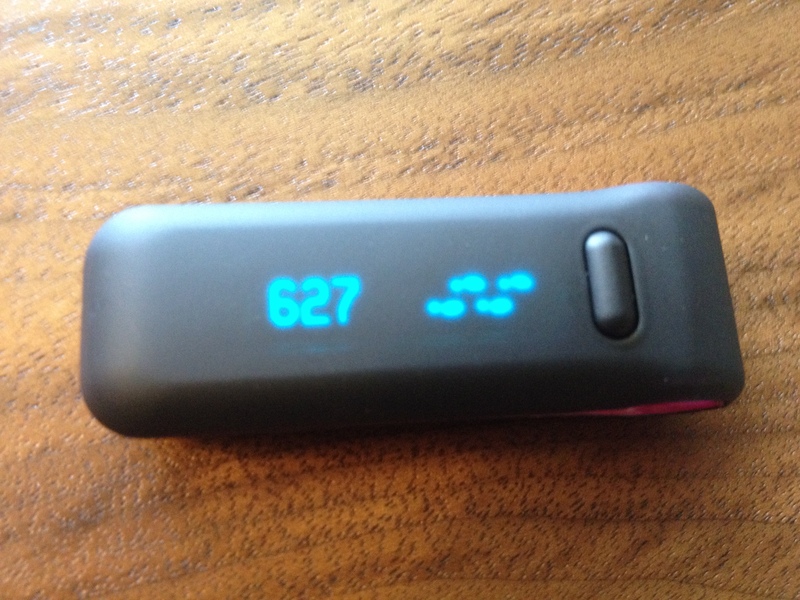 My FitBit showing I have only 627 steps this morning. Only 9,373 to go! 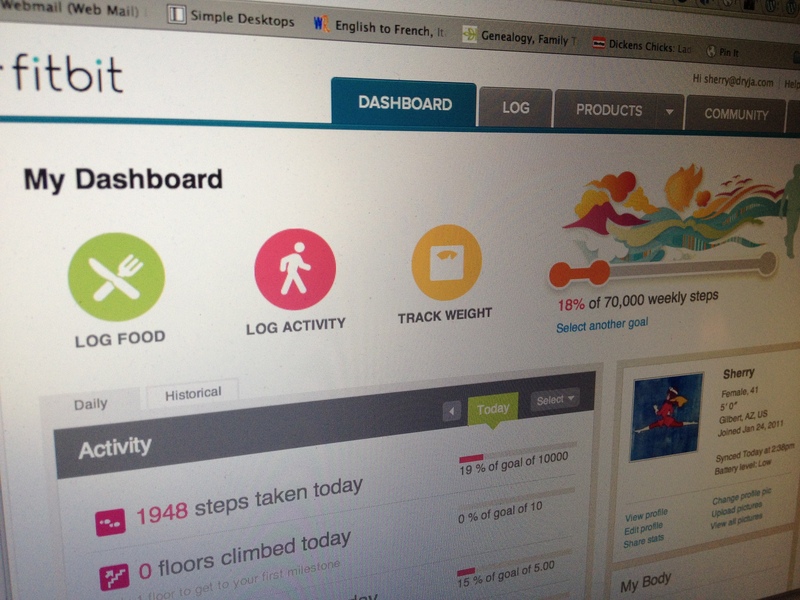 Our FitBits are a big part of keeping us focused. They track our steps and automatically update that information into a private and personalized “dashboard” on their website. We can also track what we eat and how long we sleep. All the information on our dashboard is kept private, for our use only, or to share with friends and family with whom we choose to give this information. My Dashboard on FitBit.com from earlier yesterday. It shows how many steps I've taken daily and allows me to set goals to strive for each week. When we first started walking, our minds were just focused on achieving a step goal. It was a chore, something that had to be done, like taking out the garbage or cleaning the bathroom. This was something we had to do in addition to everything else we do in a day. According to WalkScore.com, our town has a walking score of 48, which is considered car dependent. That’s exactly how we saw our town, unwalkable. We needed a car to get around and we accepted what we perceived were the limitations of suburban America. Each night, after we finished work, we drove to dinner and returned to walk on the exact same path around the exact same park over and over and over again, for an hour at a time. This is how you get healthy, I thought? It’s no wonder so many start a walking program only to get bored and drop out before they get very far. 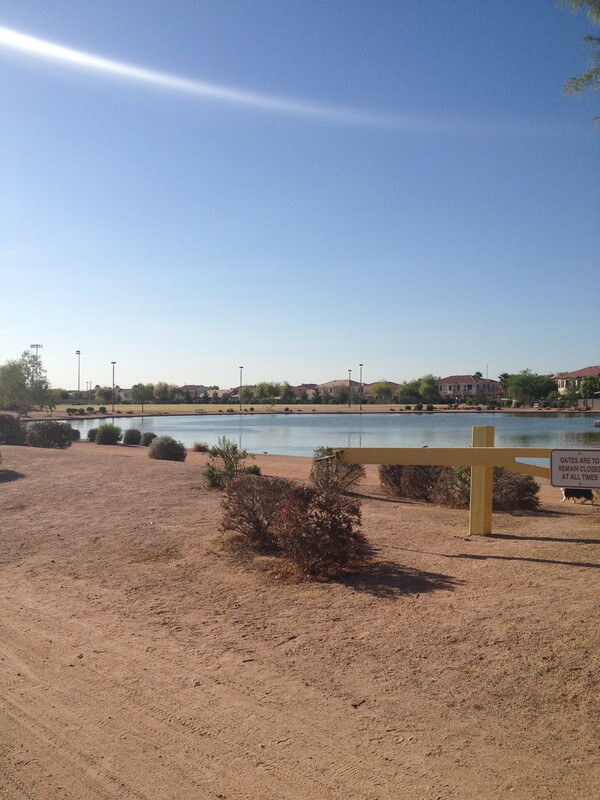 We used to walk around this little pond over and over and over again. The first couple of times are interesting, but it gets dull very fast. Then we visited St. Paul, Minnesota where we stayed in a very walkable part of town, and that’s when everything changed. We started walking to a coffee shop about a quarter of a mile from where we were staying. Each night we walked to dinner and we took near-daily jaunts to a neighborhood market for groceries. 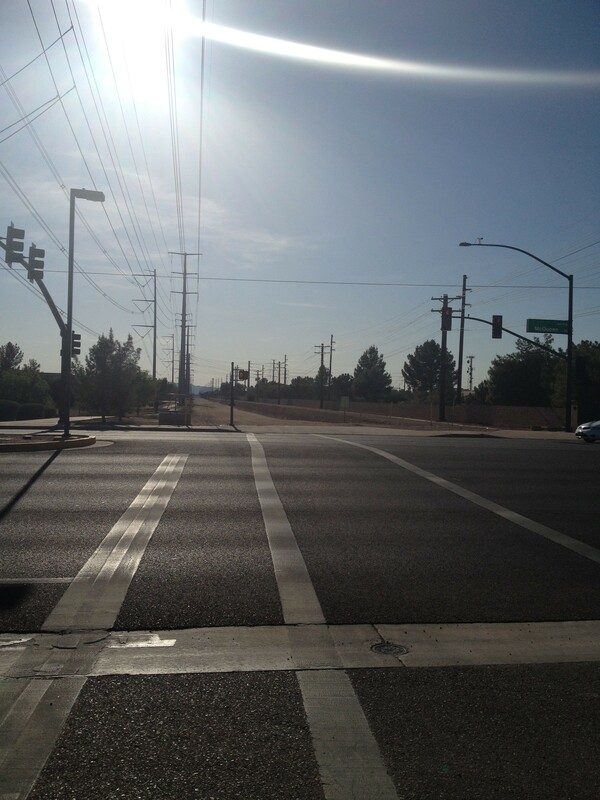 Returning to Arizona, we figured, if we could walk St. Paul, why couldn’t we walk suburbia too? 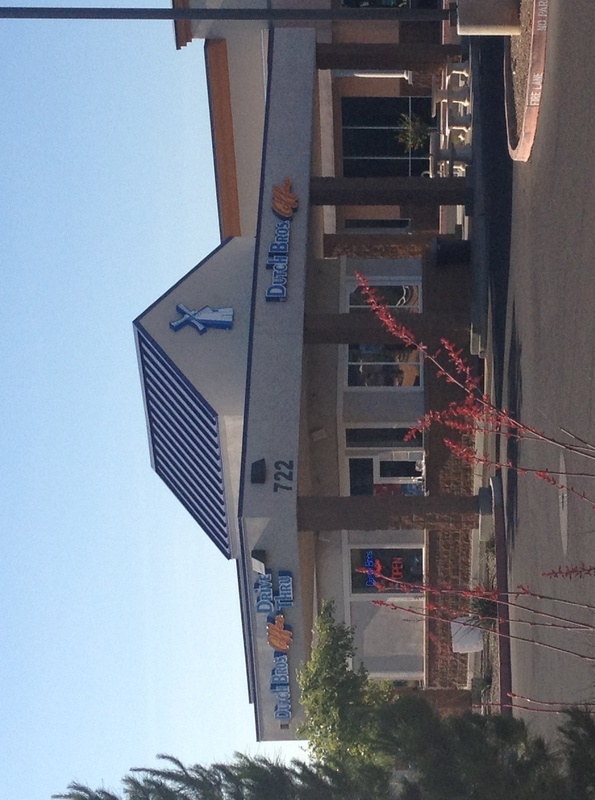 Our closest Dutch Bros. coffee shack. 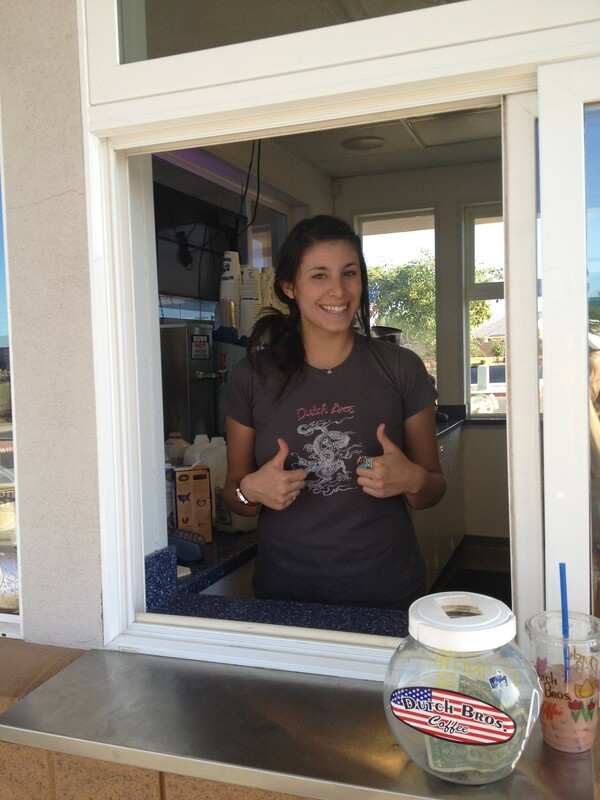 It is walk-up or drive-thru. Walking up is so much more fun. Walking to Dutch Bros. means we get to have conversations with other world travelers like Mitzu, who has walked the roads and paths of South and Central America. Next on her list? Honduras! She also introduced me to an amazing new taste sensation: an Iced Chai Soy Latte with a shot of sugar-free raspberry Torani flavoring! Everything went along great for a while, until one day we had to work a little later than usual and neither of us could take a break for coffee. By 6pm, we had 2,000 steps and we still had to eat dinner before we could get those other steps needed. It looked like we were going to have to walk circles around the park again. I need to pause here to explain something. We eat out every night. At some point during Hubby’s first days dieting, he discovered that a lot of the chain restaurants not only have low-fat options on their menus, they have that information posted on their websites, so there are no surprises when we get there. Chains tend to have nutrition info located on their websites as well, or it can be found on-the-go through various iPhone apps like Dottie’s Food Score, My Fitness Pal, and WikiWeight. While we learned how to eat better, we created a routine of going to Chipotle, Chile’s, and places like those because, believe it or not, we knew we could get things there that would fit with our new, healthier eating habits. On that particular night we still needed to eat, we needed lots more steps, and neither of us were looking forward to walking around the park a hundred times at 10pm. That’s when one of us looked up the distance from our house to Chile’s. It was 2.3 miles–the farthest we had ever walked for one of our “integration” walks. We were hesitant at first. As strange as it sounds, it seemed impossible, really. The walk was far and it would take us down busy streets, along routes we had only ever driven before. There was even a light feeling of adolescent embarrassment–we were the only ones walking those particular sidewalks along those particular streets. We were so uncool. The reward, though, was too tempting. That walk would give us nearly 10,000 steps round trip and we would break it up with dinner! Ever since then, we have been walking to dinner three and four times a week. We still go to Chile’s regularly, but we also visit local places I’ve written about before, like Flancer’s and the farmers market. Two-and-a-half miles one-way is pretty much our outer limit at this point because of the time it takes to get there (about half an hour to forty minutes). 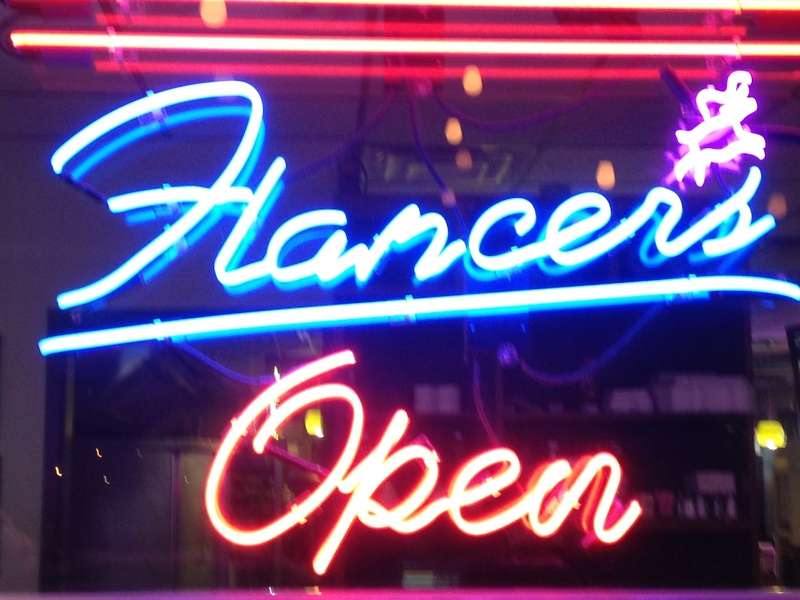 Flancer's is a weekly walk for us. 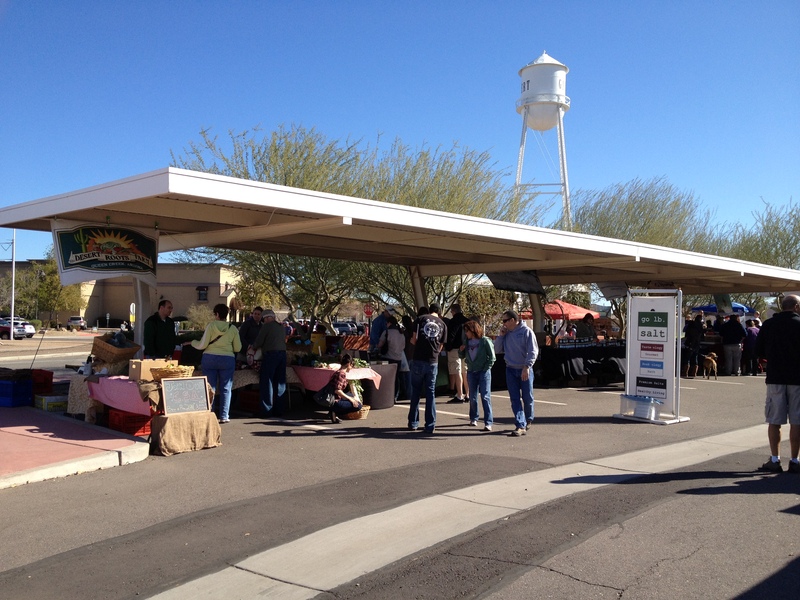 The farmers market is a little more than two miles from where we live. Not every American suburb has access to as many sidewalks and safe paths. Rural areas like where my grandmother lives in Oklahoma are tough because of the distances it takes to get anywhere you’d want to go. Still, I can’t help wondering if some of this isn’t perception. If you had asked me a year ago if our suburb was walkable, I would have told you no and sincerely believed it. What we have learned this last year is that almost anything is walkable, especially when there is some reward involved, even if that reward is simply checking off one more thing on the list of things to do. Admittedly, some places require more planning and street smarts than other places. When we walk the canal path near our house, for example, we clamber over the rock-laden moat of a railroad track so we can get to Flancer’s. 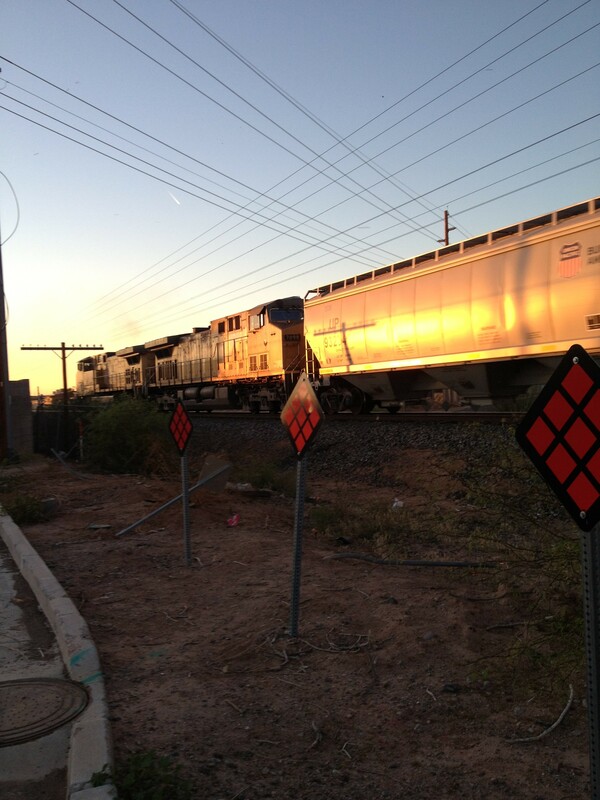 Sometimes we have to wait for the train to pass first. What I recommend to anyone interested in trying this way of integrated walking is to start out with smaller trips and add on as you feel comfortable. If possible, pick things that are actually rewarding. In my case, it was coffee. Plan ahead and take what you need to be safe and comfortable in various weather and road conditions. Backpacks and cross-body bags are best for carrying things you might need. When we go to the farmers market, for example, I pack an insulated bag with a couple of bottles of water. As we drink the water on the trip there, we make room for our purchases at the market. Of course, no matter where you go, always pay attention to the traffic around you and navigate accordingly. Never assume a driver sees you. Even with a certain amount of danger, this adventure of ours makes us happy. I have discovered, as Kierkegaard did, that I am happiest when I do not have to rely on a car to get places. I hate having to scope out and pay for parking. And we all know gas prices aren’t getting any lower. There are ways to walk and be safe, even in suburban America. Just be sure to remember your pedometer and wear comfy shoes. You are so right about it being a suburban jungle and feeling a bit “uncool” at times! It truly is amazing how footing it brings new dimensions and experiences to your world. I’m glad you enjoyed it! Thank you for always checking out my blog. Good for you guys! The town I live in is about the same as yours for walkability (I checked out that walkscore site–pretty neat! ), but my home has a score of 2. Honestly, I was surprised it was that high! Though there is a convenience store about a half a mile down the highway from us, so I guess that counts for something. Anyway, it’s fun to live vicariously through others who can incorporate walking into so much of their daily lives. Much as I love my fitbit, for now, most of my steps will have to continue coming from moving around my house, walking the neighborhood, or the exer-glider. Still, better than no steps at all, right? Thanks for visiting the blog and writing about your own experiences! Two is an even lower score than my grandmother’s town in Oklahoma! 🙂 So, yes, I would imagine it would be difficult to do as much integrated walking. Ultimately, you’re right–walking your neighborhood, moving around your house, and using the exer-glider definitely count! Keep it up and stay in touch with how it’s going! Hello from Shanghai, I found your blog through Elena and I enjoyed walking too! Since we moved countries quite a bit walking is my way of getting to know my surrounding, looking forward to read more about your ventures. Hello, Esti from Shanghai! I’m so happy to hear from you and learn of your own walking adventures. I totally agree that walking gives you a way of learning your surroundings in so many ways. I just heard that David Byrne, the legendary songwriter of Talking Heads, bikes everywhere because he says it gives him the music of a city. I’d say that’s true for walking too. I look forward to sharing more of the “soundtracks” for cities I’ve walked, but would relish the opportunity to also hear about your own “playlists”.